It is comically easy to find counterfeit or otherwise infringing goods on Amazon. 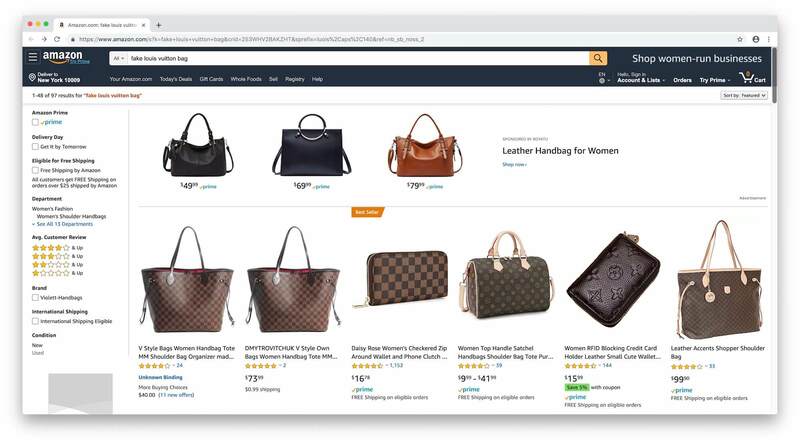 Luxury products from brands like Louis Vuitton, Balenciaga, or Gucci are not for sale on Amazon, but many shoppers are looking for them. Gucci is 299th most searched term on Amazon out of millions, Louis Vuitton is 357th and Supreme is 489th most searched term. Sometimes shoppers look for counterfeit or fake goods explicitly. Fake AirPods is 6,402th most searched term on Amazon (AirPods are wireless headphones made by Apple), Fake Gucci is 18,015th most searched term. Then there are also searches for knockoff Ray-Bans and replica Rolexes. For each of those Amazon has hundreds or sometimes thousands of results, some of which get marked with the Amazon’s Choice badge. Amazon’s systems award the badge to products customers most often buy when searching for that keyword. Most of those products do not have the brand trademark on the product itself, packaging, or even the product title. Instead, they tag the product with relevant brand keywords which are visible to the search algorithm. They also use those keywords to buy advertising on Amazon. In the example above, none of the products claim to be Louis Vuitton bags, but they each borrow brand’s famous brown design. Canal Street in New York City’s Chinatown is a major destination for finding fake designer brand handbags, wallets, and other accessories. In many ways, Amazon is that too. However, courts have ruled that Amazon is not infringing on federal trademark laws by providing “aesthetically similar” search results when consumers search for a brand that is not available on Amazon. In a case filed by Multi Time Machine Inc, maker of the MTM Special Ops military-style wristwatch, the watchmaker claimed that Amazon website does not say it does not carry MTM products when a shopper searches for it. No shopper is confused by those products. Reviews for the Daisy Rose Women’s Checkered Zip Around Wallet, a $16.78 copy of the $905.00 Louis Vuitton Zippy Organizer call it “Great lookalike,” and “Amazing Louis Vuitton Dupe Wallet.” It is rated 4.6 out of 5 stars by 1,156 reviews. Shoppers know precisely what they are getting. Some argue imitation sparks innovation. In the book titled “The Knockoff Economy: How Imitation Sparks Innovation,” Kal Raustiala and Christopher Springman argue that a coherent intellectual property policy inherently involves trading off protection and imitation. Most of the results on Amazon are not counterfeit, they are knockoffs - they do not copy the brand’s trademark, but only resemble the design of its products, which is not illegal in the US. Fashion design is not copyrightable. Per the Constitution, Congress has the power to stop copying, but these protections must “promote the progress” of creative industries. The fake Louis Vuitton bags are not pretending to be legitimate Louis Vuitton bags, and thus they are allowed to be sold. They are not competing with the brand - Louis Vuitton bags retail for thousands of dollars, have their brand stores, and their target customer is not searching for “fake louis vuitton bag” on Amazon. Amazon has many times made moves to conquer luxury goods. However, one can’t have the New York City’s Canal street with its knockoff bags for sale and build a Louis Vuitton store across the street. Instead, the real Louis Vuitton store is in SoHo neighborhood a short 5-minute walk away. www.louisvuitton.com is one click away from Amazon.com too.